potentially nervous: google what you ask? "POTENTIALLY WOODSTOCK", it's my new project. if you'd like to put us on the map. google please! google what you ask? "POTENTIALLY WOODSTOCK", it's my new project. if you'd like to put us on the map. google please! 2010! already this year feels SO much better than last year. i hope so for all of you out there as well! SHELL! what a great mantra, shell from raspberry rabbits of course. unless she stole it too? we're getting cozy, snug and settled into our little cabin and life feels happy. the bunnies are thriving and my creative ways of keeping us afloat are shifting into overdrive! i said to heck with waiting for glass orders or a reliable job to secure itself, and have decided to try to make this photography thing bring in the vegetarian bacon once and for all! so with a lot of help and encouragement from a dear friend, i started "POTENTIALLY WOODSTOCK", a local's view of the most famous small town in the world. this is just a teensy little beginning glimpse, any questions or suggestions send em! we're going a bit commercial over there, and we may even do google adsense? any opinions about that? i'd LOVE to hear from those of you who participate in that kind of thing....you know, the pluses and minuses. so without further ado please, if you have a moment to google, POTENTIALLY WOODSTOCK, BUT VERY IMPORTANT....PLEASE GOOGLE IT WITHOUT A SPACE IN BETWEEN POTENTIALLY and the WOODSTOCK. i just tried it and if you do it with a space it just brings you to PN. but if it works and it takes you to www.potentiallywoodstock.blogspot.com it will help us tremendously with the search engines, which will help this new project gain even more steam. it's taken off quite nicely and everyone that i've mentioned it to wants to be a part of it, the only thing missing right now is you....so go on over and take a peek, leave a comment and help debut our new blog. lastly but not leastly and if you ever are in this neck of the woods let us know! fatty just loves visitors! and he loves followers...so follow him, nuage and bells over there too!!! It's your blog, your creative expression, you do what you feel comfortable doing. Period. Nobody else get's to decide, that's why blogging is so much fun. If you want to advertise DO EET! If you don't then DON'T DO EET! If you want more traffic you might want to sign up as a City Daily Photo Blogger (link on right side of my Pensacola Daily Photo page) but you'll have to leave comments on other people's blogs to generate traffic. Not that you'll have any trouble doing that. I can already see that you put most of us to shame. You GO GIRL! Bit of a hurry - so I'll drop word then investigate later. I don't get many hits on my daily photo site, but i've been very bad with it lately for a lot of reasons. No clue on which ad programs work best. Of course I made it up myself. hee,hee,hee. Last year was waaaaaaaaaaaaayyyyy to crappy for me and everyone around me. Not this year baby! Not this year! I'll hop over and visit your other blog and of course I will follow. We not only googled you, we linked you on Facebook and Twitter, so hopefully you'll be seeing all kinds of visitors soon. It looks awesome! You can also do a google search with "potentially woodstock" (not all one word and in quotes) and it comes up right away. The new site looks beautiful! paula: woooOOOO!!! yes sirree maam! lorna: awesome! i will for sure check into that. what was the $25 dollars for? how many ads they placed or how many people saw them? what is it all based on? i know htey try ot match common interests with your blog, but like for PN, they may think they could advertise cages on that site...so how do they know what is considered like minded branding. if i were to do a ad thing on PN i suppose if they did ever do a cage ad i could always post about how i'm anti cages? tfangel: i have half a mind to send you 1000 bunny photos right now! you know the bunny photos aren't going anywhere, but i appreciate your concern!!! shell: i know you're sort of on your way....i can feel it! 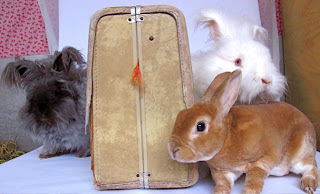 i'm not going to tell the bunnies yet though, not until you have a plane ticket! last year really was a doozie wasn't it? everyone i know had it harder than ever. people and animals were leaving the planet in droves it seems. this year has a different feel to it already, i'm going to keep up with the mantra and of course you thought of it!!!! you're such a wizard!....how's your book coming along? J & M: thanks!!!!! i don't have facebook or twitter so i don't really know how that stuff works but i have seen some hits from facebook and i sure do appreciate it! julie: great! it wasn't doing that yesterday yet so i guess we're moving right along. How on earth did you get Fats in a pic with B & N without him killing them?!?!?!?! Will definitely check out PW.